Improves the taste of water by removing relative chemicals. A basic unit which fits simply under the kitchen sink and comprises a single polypropylene filter housing and bracket ancillary swan-neck tap, tubing and self-tapping saddle pipe connection. 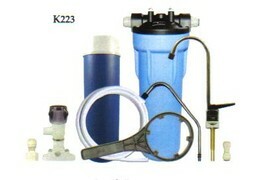 Installation requires the drilling of the work-surface top or sink-unit to accommodate the ancillary drinking water tap, the suspension of the filter by screwing the bracket to the side of the cabinet and connecting into the cold water by attaching the saddle, containing a self-piercing valve, around the pipe. The housing contains a Granular Activated Carbon filter which will reduce harmful organic chemicals as well as taste, odour and chlorine. Scale can additionally be inhibited with an alternative carbon filter (TS-GAC), please specify when ordering.